Looking for a dynamic speaker for your next event? 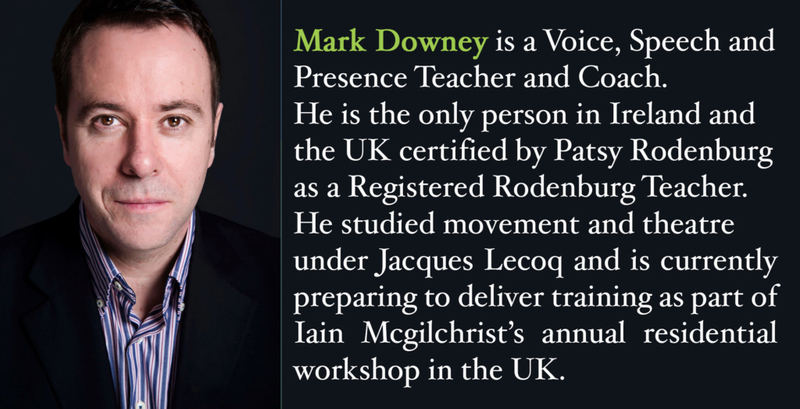 Hire motivational speaker and master storyteller Mark Downey to boost your organization’s understanding of leadership, creativity or culture. Mark Downey, Registered Rodenburg Teacher, brings his unique world class experience to deliver high energy ground breaking yet practical truths and tips about our non-verbal and verbal ‘Presence’ in life and in the workplace and shares his expertise to help you unleash powerful leadership impact. He ignites his audience with charismatic and inspiring speaking skill, driven by deft storytelling and sophisticated humour. Dublin, Lisbon, Leadership Skills Courses, Leadership Presence, Leadership Development, Executive Coaching, Communication Training, Presentation Skills, Learning and Development, Charisma Coach, Public Speaking Coach, Public Speaking Training, Public Speaking Course, Motivational Speaker, Keynote Speaker, Keynote Speaking, Public Speaker, Public Speaking Agency, Voice Coach, Networking, Registered Rodenburg Teacher, Patsy Rodenburg, Online Coaching, Online Training, Media Training, Pitching for Business ,The Art of Negotiating, Media Interview, Camera Training, Business, Engagement, Training, Personal Development, Professional Presence, Language Skills, Conference, Conference Speaker, Web summit, Dublin, Ireland, Lisbon, Portugal.Mark Downey, Dublin, Lisbon, Europe, Leadership Skills Courses, Leadership Presence, Leadership Development, Leadership Impact, Executive Coaching, Executive Presence, Communication Training, Presentation Skills, Learning and Development ,Story Telling for Business, Charisma Coach, Creativity for Business, Webinar Training, Public Speaking Coach, Public Speaking Training, Public Speaking Course, Motivational Speaker, Keynote Speaker, Keynote Speaking, Public Speaker, Public Speaking Agency, Voice Coach, Networking, Registered Rodenburg Teacher, Patsy Rodenburg, Second Circle, Certified Voice Coach, The Patsy Rodenburg Master Teacher Certification Program, The Right to Speak, Ted, Presence, Presence in Workspace, Online Coaching, Online Training, Media Training, Pitching for Business ,The Art of Negotiating, Media Interview, Camera , Impactful Meetings, Successful Interviews, Interview Training, Voice Coach, Voice Coaching for Business, Voice Training, Training, Europe, Confidence Building, Business, Engagement, Training, Personal Development, Strong Leader, Business Development, Start Up, CEO, Crisis Management, Language Leader, Speaking at TED Conference, TED Talks, Public Speaking, Speech Writing, Storytelling, Management Training, Human Resources, Entrepreneurship, Professional , Start Up Company Training Courses Programmes, Presence, Language Skills, Conference, Conference Speaker, Web summit, Dublin, Ireland, Lisbon, Irish Business, Performance, Portugal, Europe, Speech and Presence, Mark Downey, The Art of Leadership Presence, Tedex.